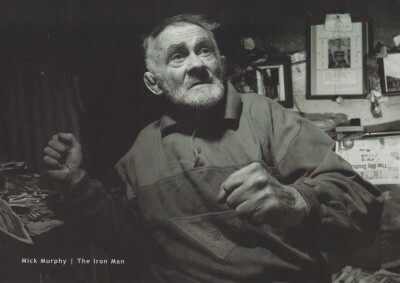 Mick ‘The Iron Man’ Murphy by Barry McCarthy from the exhibition ‘Blood, Sweat and Gears,’ 2008. Mick made a living as a spalpeen and a circus performer. After winning the 1958 Rás, Mick returned to Kerry to work in local quarry, breaking stones with a crowbar and sledge hammer. All the while, the Iron Man was completing daily training routines of 100-mile cycles. Aged just 27 years, Mick Murphy retired and took the boat to England where he worked as a builder, road maker, a carnival act, boxer and a wrestler. Mick’s training was as unconventional as his lifestyle. Having read about the important of a high protein diet, Mick drank cow’s blood and ate raw meat, well aware that this was regarded with “horror” by the people of Cahersiveen. The legend that was the ‘Iron Man’ was the starting point for an exhibition that celebrated the 50th anniversary of his victory in the Rás in 1958. The exhibition consisted of still photography by Barry McCarthy interviews recorded by film maker Chris Hurley. 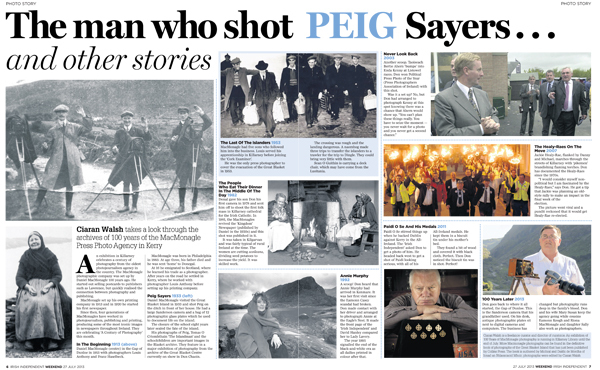 The impact of that exhibition is captured in Sean Mac an tSithig’s report (above) which was recorded for the main evening news. Mick Murphy was one of the most remarkable people I worked with in Siamsa, a true folk hero. Following the broadcast of Seán’s film a lot of men who had gone through similar experiences came to the gallery and spoke movingly of their lives as emigrants and their love of cycling. I haven’t been involved in in the production itself, just the research into historical social documentary photography and the people who work in this area. This material has been “translated into television” by Cathal Watters (Oíche na Gaoithe Móire) and follows the TG4 controversial format of presenter driven, on-the-road info-tainment. (Lost in Translation). I have no idea what to expect. Like a colleague I will be watching from behind the couch … hoping! It’ll be interesting to see how the balance between a social history of documentary photography and ‘factual’ entertainment works out. The reliance on off-the-cuff interviews rather than scripted narrative is a risky business in general Read Full Article. It suits some formats but I don’t know about a documentary on 19th century photography, with it’s intricate social, political and historical contexts and plots. I know some key “voices” were excluded but that is the unenviable task of a producer. Dropping a key commentator on the history of photography because, apparently, there were already enough English speakers is a bit odd though. Either way it promises be an intriguing televisual event and, at the very least, it should create an awareness of the rich resource that exists in photographic archives and collections around the country. 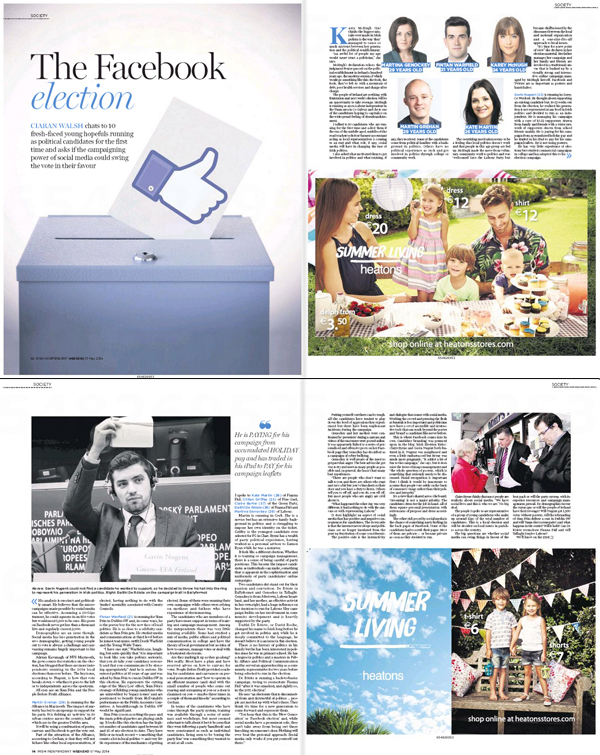 A major feature by Ciarán Walsh on local elections 2014 in Ireland is published in the Irish Independent Weekend Magazine edited by Katie Byrne. The article looks at young candidates who are competing in the elections for he first time and questions whether this is a response to widespread disenchantment with the political establishment and, whether a new generation of politically smart young people can challenge the status quo through the use of social media and other techniques. The article is based on ten interviews carried out 2 weeks prior to the election and was published the weekend before voting takes place. Jpeg of the feature writen by Ciarán Walsh for the Irish Independent Weekend Magazine, edited by Katie Byrne. Commissioned by Irish Independent ‘Weekend’ Editor Katie Byrne, ‘On the edge of Utopia’ examines the life of Eco-Villagers in Cloughjordan in County Tipperary. Since the crash of 2007 this community has defied the odds and built the Cloughjordan Eco-Village, a template for sustainable living in rural Ireland. Ciarán Walsh examines how they are getting on. In all good newsagents and online on Saturday 2 February 2014. The ‘ Irish Headhunter’ exhibition organised by www.curator.ie got a remarkable response from anthropologists working in Ireland. The project was featured in the Irish Journal of Anthropology and the exhibition was shown in the National University of Ireland Maynooth (NUIM) which has the only Anthropology Department in the state. 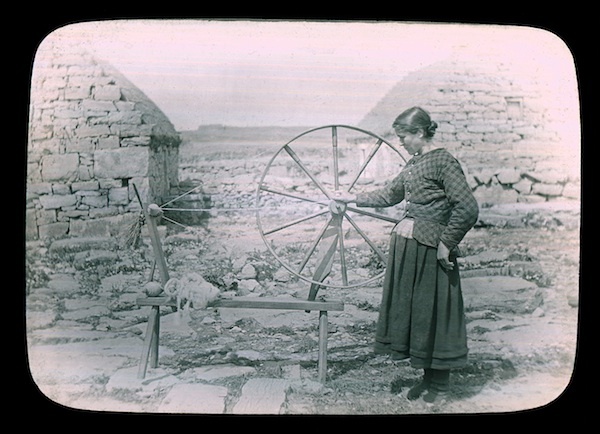 This switched the focus from the 1890s to the present and, in this feature commissioned by the Irish independent Newspaper editor Katie Byrne, Ciarán Walsh explores the role of contemporary Irish anthropologists. It features extracts from interviews with Mark Maguire, Head of Anthropology in NUIM; Nicola Reynolds, President of the Anthropology Society NUIM; Fiona Murphy, Dublin City University School of Business and, Patrick Slevin of Applied Research for Connected Health (ARCH). Each of the contributors outlines what they see as the main challenges facing Irish society in 2014 from an anthropological perspective. 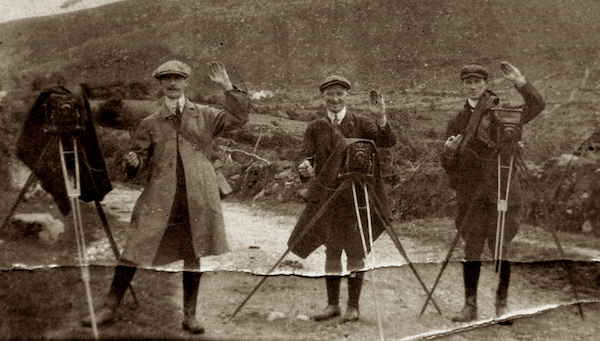 Daniel MacMonagle (centre) in the Gap of Dunloe in 1913 with photographers Louis Anthony and Franz Haselbeck. 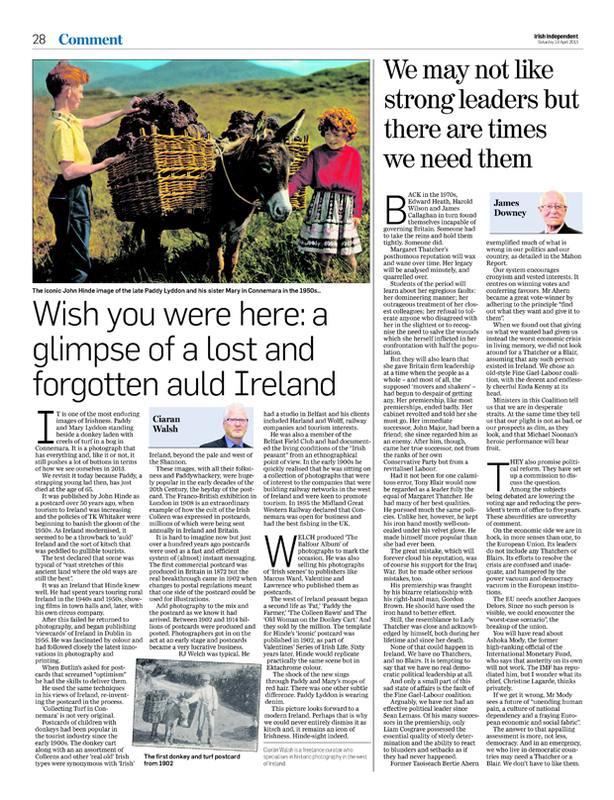 Ciarán Walsh / www,curator.ie is currently working with Don MacMonagle on a piece for the Irish Independent on 100 years of photography by the MacMonagles of Killarney. A centenary exhibition opens in the Library in Killarney on 6 July 2013. 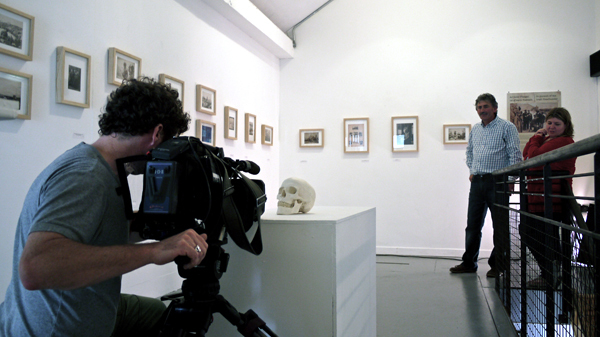 Clár Imeall, TG4, films a feature on ‘The Headhunter’ exhibition in Áras Éanna, Aran. Comments Off on Clár Imeall, TG4, films a feature on ‘The Headhunter’ exhibition in Áras Éanna, Aran. Clár Imeall, the arts and culture documentary programme on TG4, spent the day recording a feature on ‘The Irish Headhunter’ exhibition currently on show in Áras Éanna, the arts centre on Inis Oírr (Inisheer), the Aran Islands. Directed by Maggie Breathnach of Red Shoe Productions and filmed by Andy with contributions by Ciaran Walsh /www.curator.ie, Caomháin Ó Conghaile, Inis Oírr, and Deirdre Ní Conghaile who has just completed a fellowship in the University of Notre Dame. The programme will be broadcast in October 2012.